The National Mall is a temple mount. George Washington, Alexander Hamilton, Patrick Henry, Thomas Jefferson, John Hancock, Benjamin Franklin – to an American, these names take on a mystical quality. The Founding Fathers are our secular version of the cult of saints; the Revolution a conflagration of Biblical proportions. To an American. In the end, I know just the barest details of the conflict, a list of names that are all what and no why. One of the best things about Ubisoft’s flawed Assassin’s Creed III is how diligently the game works to restore context to those history lessons. Every time the player goes somewhere, meets someone or experiences something, a new encyclopedia entry is added to the database. They are addressed to Desmond, the modern American experiencing the memories of his ancestors via the Animus machine, and they are intended to provide him with additional historical context. Interestingly, the factoids are written in-game by an Englishman, Shaun Hastings, which means they are filtered through his home country’s perception of the rebellion. There are other layers of the onion, though. In real life, American screenwriter Corey May wrote the game with a team of historical consultants, Ubisoft’s main studio is in Quebec, Canada, and ACIII boasts a multi-national development team, all of which potentially contributes layers of perspectives to the game’s take on historical events. In my recollection of the school days version of the story, the colonists were suffering draconian taxes levied by a corrupt and distant king. Pushed too far, they rebelled, eventually winning their independence. 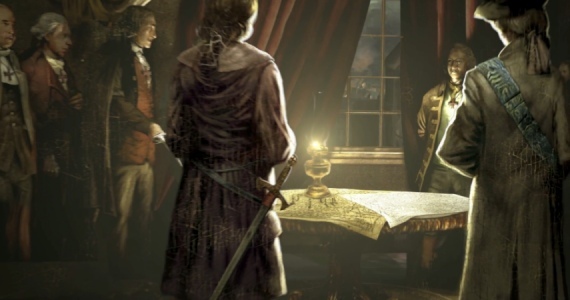 However, Assassin’s Creed III begins during the earlier French and Indian War, underscoring the fact that those taxes, draconian though they may have been, were intended to pay off a costly war during which Britain protected the interests of the colonists. In one memorable scene in the game, Hastings likens the whole conflict to a squabble over a dinner bill. Framed like this, it isn’t so clear cut that the Brits were jerks and the Patriots righteous – the game is happy to point out that the majority of colonists remained neutral during the war due to the bad habit both sides had of seizing private property. Agitation for war began in earnest in the area of Boston, Massachusetts, thanks to the Sons of Liberty. Often the subject of romantic tales in the years after the war, the Sons were actually a loose knit underground organization of middle class merchants bent on defying British tax laws. They did this by inciting riots, destroying property, tarring and feathering public officials and, in one case, torching a ship of the Royal Navy. Imagine a similar organization running rampant in Boston today and you would call them terrorists and criminals, but that is just the other side of the heroic coin. Rather, these are intelligent men with a complicated political and economic agenda, not mustache twirling blackguards nor knights in shining armor. The game is careful to make the Sons out as such. The game’s overt narrative also goes to lengths to keep things complicated. The main character, Connor, is half British and half Mohawk and, while he joined the Assassins in order to protect his tribe, the path to his goal is never clear. He only aids the Patriot cause reluctantly. Meanwhile, the Templars – the ‘bad guys’ of the series – support both sides of the conflict in service to their own seemingly altruistic goals. The previous Assassin’s Creed games had Templars who were obviously cut from villainous cloth – Borgias and Pazzis and opportunistic Crusader knights. Here, though, Connor fights these Colonial Templars not because they are nefarious, but because that is just what Assassins are meant to do. 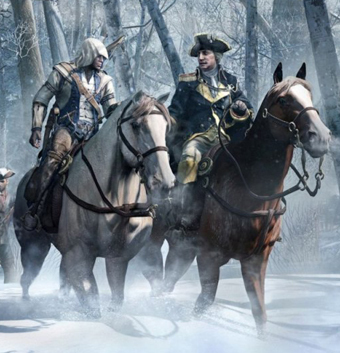 Regardless of the outcome of Connor’s conflict with the Templars, history tells us that the Patriots win. Unfortunately for Connor, we also know things didn’t go very well for the Mohawk and other native nations once they did. To them, our secular saints were devils. We’re obsessed with binaries. Good guys and bad guys, winners and losers, right and wrong. They are appealingly simple dichotomies, but woefully inadequate. Be it a nation-changing war or an argument between friends, disagreements are a matter of perspective, endlessly subtle and nuanced. To simplify them is to lose the lessons that they can impart. Stu Horvath is constantly looking for nuance on Twitter @StuHorvath. He’s a very diappointed person.